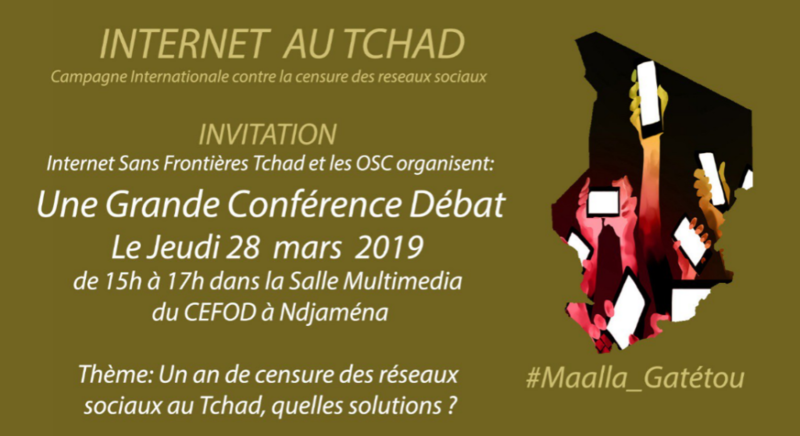 Paris March 27, 2019 – Internet Without Borders and its Chadian and international partners, gathered around the coalition #Maalla_Gatétou (Editor’s note: Why did you cut in Chadian Arabic), launch a series of actions on March 28, 2019 to commemorate a year of social media shutdown in Chad, a country in Central Africa ruled, for nearly 30 years, by President Idriss Déby Itno. The first multi-stakeholder conference, bringing together representatives of the government, private sector and civil society on the issue of censorship of social media, will take place on Thursday 28 March in N’Djamena from 3 PM to 5 PM (UTC +1). This round table will discuss the political, social and economic assessment of a year without social media networks, and the way out of the crisis. Internet Without Borders also announces the closing of its fundraising campaign “VPN against censorship in Chad“, to fund the purchase of Internet connection data, to access reliable and secure VPN for journalists, activists, human rights defenders in Chad. Our Partner Top10VPN, which lists here free and secure VPNs, has donated 1500 euros, allowing us to reach the desired amount. On March 28, 2018, Internet Without Borders was alerted by its Chadian correspondents of the inaccessibility of a number of popular Internet websites on the networks of the two main operators Tigo Chad and Airtel, in particular, the social media Facebook and Twitter, and the Whatsapp and Viber messaging applications. Very quickly, thanks to our partners at OONI and Netblocks, we have been able to confirm, through technical measures, the occurrence of deliberate censorship. Despite two judicial cases, before the civil court and before the Chadian constitutional judge, reports submitted to the UN Human Rights Council as part of the universal periodic review of Chad, demonstrations, and letters to special rapporteurs for the Freedom of expression at the UN and the African Union, the Chadian government remains irresponsive, and maintains a disproportionate, illegal and unjustified censorship. Internet Without Borders urges the Chadian government to end a censorship measure that violates the right to free expression online of its citizens and negatively impacts the country’s economy and opportunities of Chadian youth. Internet Without Borders is a French association, under the 1901 law, and an international network of non-governmental organizations whose objective is to promote the free flow of information and knowledge, to defend digital rights and freedoms and to fight against all forms of censorship on connected networks. Internet Without Borders was founded in Paris in 2007 by a group of civil society activists following the censorship of the Internet by the Burmese junta. Internet Without Borders is present in Brazil, Chad, Togo, USA, and has a vast network of partners and collaborators. Top10VPN.com is the world’s largest VPN review site. They have helped millions of Internet users in more than 190 countries find the right VPN to protect their privacy, free speech, and digital rights online.